DELPHOS — They had only talked on social media before they met in person for the first time on July 3 and hit the Buckeye Trail the next day for a 4-month hike. 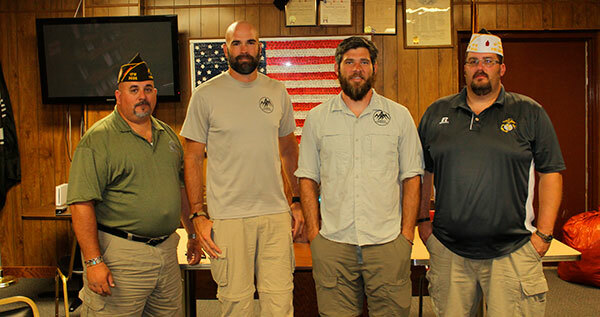 Veterans Sterling Deck and Martin Strange are participating in the Warrior Expedition Program inspired by Earl Shaffer, who in 1948 told a friend he was going to “walk off the war.” Shaffer was trying to process what he saw, heard and lost during World War II. Four months later, Shaffer became the first person to hike the entire length of the Appalachian Trail from Georgia to Maine. Deck, an Army veteran serving from 1992 to 2013, hails from Hamilton. Strange, a former U.S. Marine, served from 2005-09 and is from Bowling Green. They were matched for the expedition after a rigorous questionnaire and Skype interview. “I did a hike last year and I was online looking for something to get outdoors,” Deck said. Strange had a friend who hiked the Appalachian Trail and told him to check into the Warrior Expedition. Being a combat veteran is a requirement to be considered for the program. The pair said the program gives veterans who have experienced combat situations a positive, healthy alternative compared to other habits. Strange finds amateur photography during his hikes is an outlet. The Buckeye Trail, meandering for more than 1,444 miles in a loose loop around the state, meets up with the Miami-Erie Canal south of Delphos and then heads out of Delphos to the north once it crosses Lincoln Highway. The men started in Edin Park near Cincinnati and will end their trek on Oct. 9 in Milford, approximately 10 miles from where they started. They hike 5-6 hours a day. Seven hours is a long day. Breaks are also built into the hiking schedule. As the days got warmer last week, they would get up earlier and get their miles in before the worst heat of the day. The program supplies their hiking equipment, food, water and shelter or a motel/hotel room. Stops at VFW Posts are also on the schedule. Deck and Strange walked into Delphos on Saturday morning and were met by local VFW Quartermaster Dave Edelbrock, who took them to the Microtel to rest and shower. The post hosted a dinner for the pair Saturday night and took them back to the motel to rest before they headed back out early Sunday morning. They hoped to hike 14 miles on Sunday and stop on the other side of Ottoville before heading to Bowling Green for an overnight and a stop at the local VFW.